Did you get stuck with the drumsticks as a kid? WHY do people just ASSUME kids want or will eat, drumsticks? My mom makes the best fried chicken this side of the continental divide and every dang time, when I was little I got served up a drumstick. Please tell me this wasn't just at my house when I was a kid. Tell me the rest of the children of the world got shafted of a choice and just got drumsticks too!? Well, as luck would have it, in my older, young age, I love them. 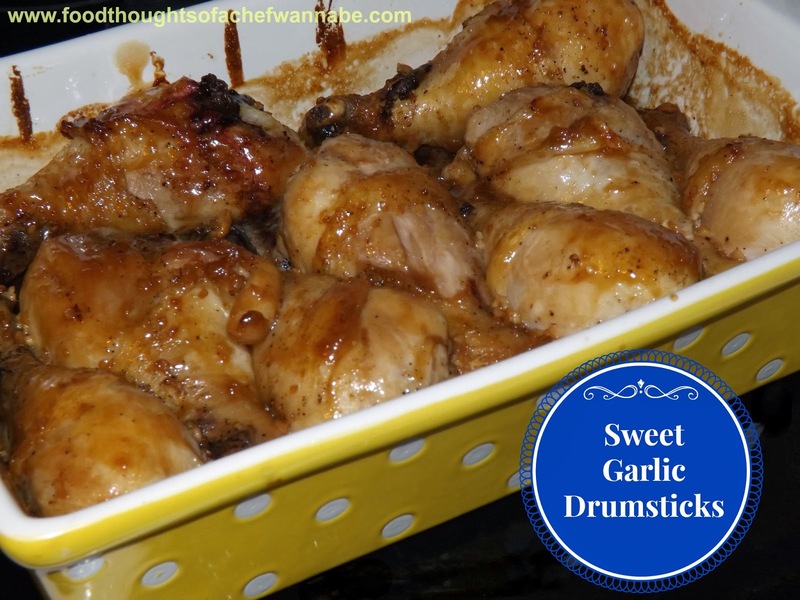 I love white meat, I love dark meat, and now, I actually WANT drumsticks. I have kind of been on a kick of trying to bring you recipes with affordable ingredients. Chicken drumsticks are ALWAYS on sale at my food store and I thought I would grab some and make something delicious. I can't help that it involves garlic, that is just something weaved into my genetic code. My husband loves "sweet" with meat, which is not one of my favorite flavor combinations. However, as I was taking these babies out to thaw, I was reminded of a wing recipe my sister Anne (#5) used to make, or made for me a couple of times, SO long ago. So without asking her, because I know she will never remember, I thought to myself, "self, you can just do what you think she did". And I did. And it is awesome. This is a great weeknight meal, quick and easy, and budget friendly. A one dish pony, that is sure to please, because even when you think you don't have a choice, you find yourself choosing drumsticks! In a large skillet, heat 1/4 cup of your vegetable oil. Salt and pepper your drumsticks well, and in batches, brown them in your skillet, on all sides. You aren't cooking them through, you are just creating a nice brown crust. When they are browned, place into a casserole dish that is large enough to hold the amount of chicken you are using. Set aside. In a small bowl combine remaining vegetable oil (1/4 cup), brown sugar, soy sauce, garlic, honey and black pepper. Whisk until completely combined and pour over chicken sparingly. Using a pastry brush, brush each piece of chicken with sauce you drizzled, and then pour over more of the sauce. Leave a small amount in the bowl if desired to brush over chicken when it is removed from the oven. Not necessary but an option. Bake for 35-45 minutes, make sure you have a safe internal temp of 165 degrees F.
Enjoy this easy, but delish chicken dish! OK, admit it. You have had an occasional moment of feeling like you were sick of the same old way you made something and after a bit of thought, decided to try something new. In the end it was either amazing, or it sucked so bad, you had to throw it away. Right? You remember it well, don't you? I had one of those moments the other day. It involved bread for a huge pot of spaghetti. I just, I just....couldn't do regular garlic bread. My sister does this thing with mayo on garlic bread and the thought of heating up mayo and then consuming it almost makes me erp, so that was NOT an option. I had to come up with something new. So I did it. 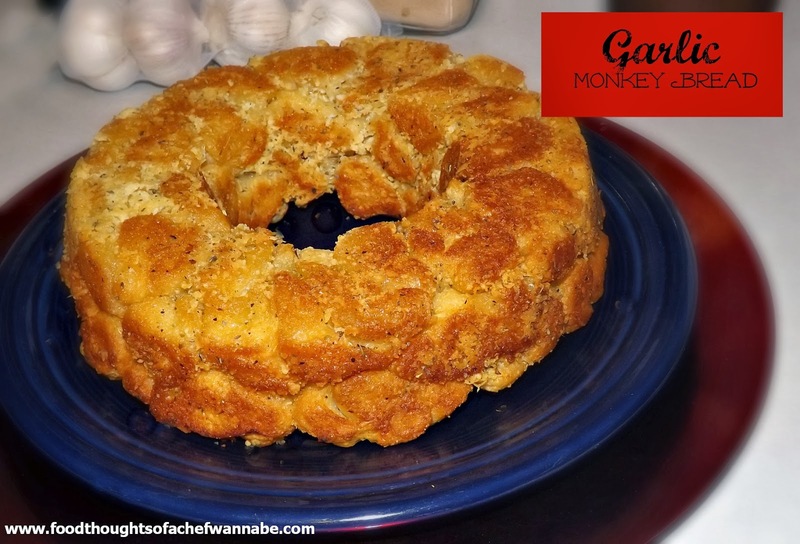 Oh yes, I did, I did it, I dared mess with monkey bread. And trust me on this one, you are going to be so glad I did. It turned out so perfect, that even I, still can't quite believe its delight. Have I verbally patted myself on the back enough? HA! So to my "Monkey Bread Queen" sister, Patty, instead me saluting you sista........it is time you get up and salute ME! I took your monkey bread, I MONKEYED with it. (hardy har har, I know). So take that one, Martha Monkey Bread Stewart! When you make this bread, use the cheapest, little biscuits you can find. That is what I used. I mean you could use the big ol' Grandes but, why? Trust me when I tell you this in Unhealthy enough, it doesn't need help. Serve this alone with dinner, or serve it with a bowl of marinara for dipping for a party! Preheat your oven to 375 degrees F. Make sure you biscuits are cold when you start, or you get to spend time pulling apart, warmish globbed together dough and it isn't fun. So let's start with something else. In a medium bowl combine, parm cheese, garlic, olive oil, and salt. Use a fork and just combine all ingredients. Set aside. Using a pastry brush or paper towel, brush your bundt pan with some melted butter. Not all of it, just dip in and butter it well. You could also spray with some nonstick spray, or both, I mean, let's pull out all the stops here! Now take your biscuits and cut each biscuit into 4 pieces and throw it in the Parmesan cheese mixture. Continue until half the biscuits are cut up. Toss biscuits in the Parmesan cheese mixture and then spread evenly in the buttered/sprayed bundt pan. Drizzle over HALF of the melted butter. Repeat with the second container and a half of biscuits, and then drizzle over the second half of melted butter. Bake for 25-35 minutes. It will be golden and beautiful and the smell will make you need a bib. Seriously! Let cool for 5 minutes in the pan, and then you can turn it out on to a plate or platter! Can you believe it is the week before Christmas already? WHY does this always sneak up on us? I mean, we know it is coming, same time, same month, same place, every year, yet we catch ourselves never ready!! Since I got to see my kids and have an early Christmas, the Sunday after Thanksgiving, my gifts are bought, wrapped, opened and hopefully being enjoyed! All I have left is a few things for my husband and time to do some fun baking, and soaking up my favorite Christmas movies all week! As promised, I have another easy, no bake, Christmas recipe for you. I love chocolate and peppermint together, so I figured I could make something using both, AND white chocolate fudge. Seriously?! Totally serious. Now get this made, so you can get that shopping finished, those gifts wrapped, and take a minute with a hot cup of your favorite beverage in front of your tree to remember the true meaning of Christmas, and who and what is REALLY important this Christmas season! Wishing you the best Christmas of your LIFE! Line an 8x8 or 9x9 baking dish with a piece of parchment for easy removal of dessert when finished! Place chocolate crackers into your food processor or in a Ziploc bag and make crumbs out of those babies. Next add in melted butter, to either the processor or right into the bag. Process until combined or mash around in the bag until combined. Either way will work perfectly. Dump into prepared baking dish and press crust firmly and evenly into the bottom. Set aside. 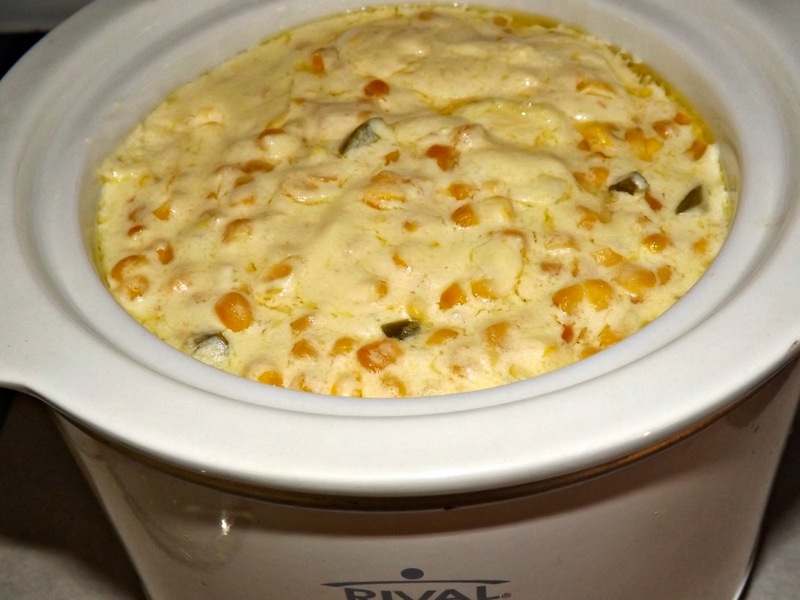 In a saucepan, SLOWLY melt together white chocolate chips and condensed milk. 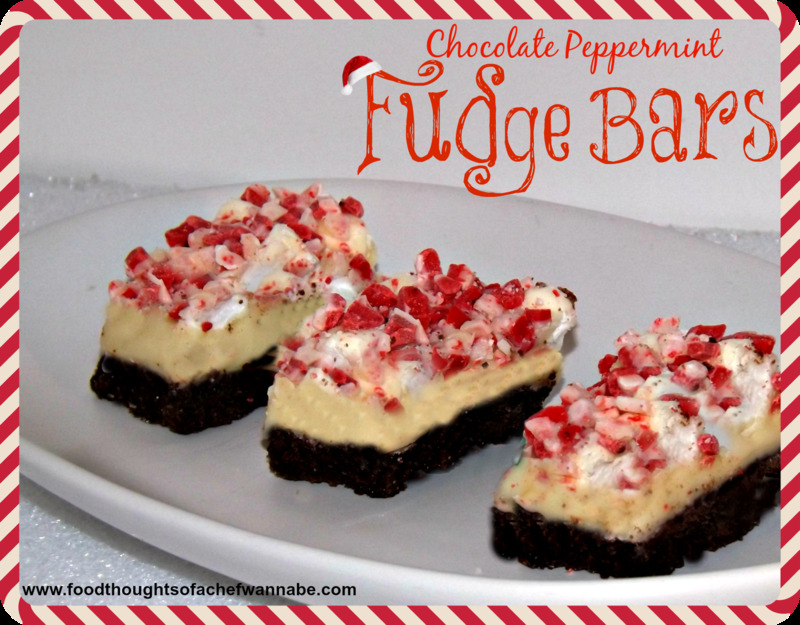 (you may recognize this as my easy fudge recipe only using white chips). When all ingredients are melty and combined and smooth, stir in marshmallows and pour over cookie crust. Gently make sure it is spread over the entire pan. Sprinkle over your peppermint chips until the entire top is covered. I went a bit overboard on mine. So be it, peppermint on my friends.....peppermint ON! Refrigerate for at LEAST 2 hours, overnight would rock. Using parchment that you let hang over the edges, lift out of the pan and cut! I cut small pieces, it is rich AND thick. When not serving keep refrigerated. Enjoy this delish holiday treat. It is one of my very favorites now! I promised to pull out the stops and still get you some easy Christmas (or just winter in general) treats and I WILL!! I love that nearly all of the recipes I am getting to you this year, are kid friendly. GET YOUR KIDS in the kitchen, they will love it and you will find they will be more likely to eat what they think they don't like if you let them help cook or fix it! I know it isn't hard to get them to eat treats, but in general, I found it to be VERY true! Some of my best Christmas memories are those spent baking with my mom and sisters. I would say I am into snow this year. But I'm not. I would say I am into balls this year, but, that...isn't appropriate. ANYWAY. That being said, I am not sure where the idea of these came from other than I wanted to make something that looked like a snow ball. I made some white chocolate covered Valentine Rice Krispy treats last year but they were a bit different. I went with the traditional rice krispy treats and fancied up the aftermath, so to speak! I used white chocolate chips but use the melts if you so choose or almond bark. No biggie there. For after the chocolate dipping I went with coconut, snowflake sprinkles, fancy flaked sugar, white edible pearls, and I think that is it. You know I was just in NJ so I picked up some fabulous sprinkles at the Amish Market. Only to come home and find 9 HUGE bottles of Christmas sprinkles in the big bowl of sprinkles. Oops. (teehee) I hoard sprinkles, apparently. Like I said, these are easy, and they will look great on your UNBROWN cookie trays! In a large pot, add in marshmallows and butter. Stir on LOW until melted and combined. Add in rice Krispy cereal and mix until ALL combined. Let sit 10 minutes. Using a cookie scoop or a spoon, roll into individual balls. I got approx. 32 out of my mix, but it will depend on how big or small you want your snowballs to be! When you have rolled them, place them on a baking sheet lined with parchment and refrigerate at least 1 hour, I did mine overnight. You want them nice and set! Melt your white chocolate 15 seconds at a time in the microwave. I use a pint size ball jar for mine, I find it easy to dip in and out quickly! Stir between each 15 seconds and add a few drops of vegetable oil if your chocolate needs thinned out a bit for easier dipping. Get your sprinkles, coconut, sugar, whatever you want to use, ready for dipping. I just used 4 bowls and put one kind in each one. Using a toothpick or skewer, stab your balls, (omg that sounded horrible but I am leaving it) one at a time, dip in white chocolate, and then GENTLY top on your jar to get ALL excess chocolate off. Then roll in your sprinkles or coconut or sugar of choice! Place on your cookie sheet, pull out the skewer and move on. When you are finished, refrigerate again for 1 hour to set. I LOVE these little snowballs. I love using different finishing sprinkles, and items to give them all a different texture and I love that you expect them to be cake pops and they aren't! 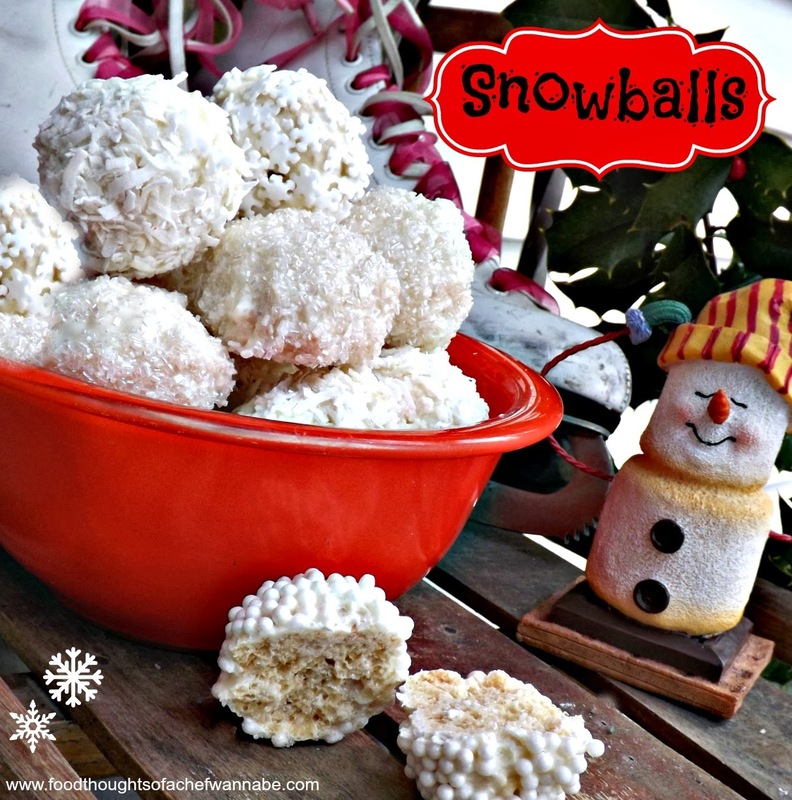 If snowballs could be an elegant Christmas treat, these would be your snowballs! PS. How cute would 3 of these look in a little favor bag for winter party favors?!? Ahh! Hello my friends! Long time, no see! As many of you know, I have been home in New Jersey for the past 3 weeks. My father in law became ill very suddenly, and passed away 3 weeks later. We spent a lot of much needed time with my mother in law, children, granddaughter, brother, and all of our family and friends. I popped online a few times but, this is my first new post in awhile. I had a couple extra done so I spread those out while I was away. Anyway, I am obviously finding it hard to jump right into the Christmas season. Normally I would have jumped in a month ago, but I think I can pull out some delicious easy, Christmas cheer for you all! It might not be as much as normal, but I got home at 7pm on Wed night and spent all day yesterday and so far today, in the kitchen. I see that Facebook is having another temper tantrum and while I was blessed to never have the issues other bloggers did with their fan pages, I am having it now. Hardly anyone is seeing my posts, and very few new fans, as of late. Please make sure to spread the word about Foodthoughtsofachefwannabe and make sure to follow me here directly, twitter, instagram, Pinterest, or whatever social media you groove on! That being said, many of you may not have seen my request to discuss, "Egg Nog". People either love it or hate it, and I am not such a fan myself. My husband on the other hand, is ridiculously in love. I wanted to make him a special treat, and in the end, I LOVED them too. I wanted to make it into a cupcake. For the record, I just shopped at my first "The Christmas Tree Shoppe" in Jersey, where I bought no less than 15 new cupcake liner designs. What that means for you is to be expecting some amazing, OVER the top, RIDICULOUSLY amazing cupcakes. HA! 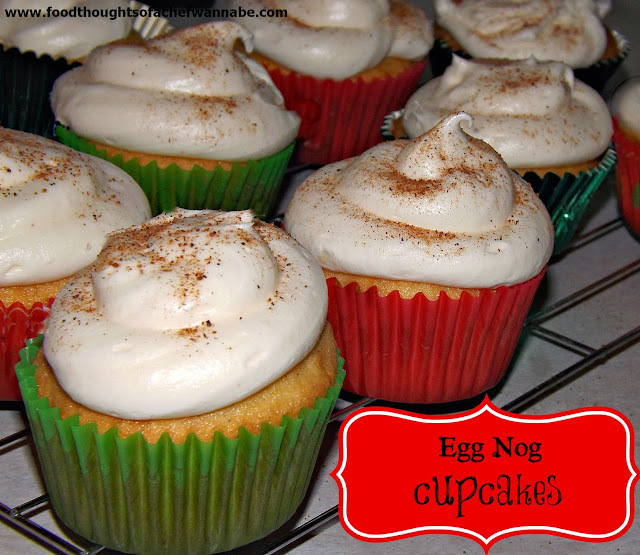 The egg nog flavor is light and creamy, and the frosting.......get outta here, it is creamy perfection! The recipe couldn't be easier, the cake is fluffy and light and the icing is perfection! I hope you enjoy these, even make them into minis, you won't be sorry, trust me. Preheat your oven to 375 degrees F. In your stand mixer or in a bowl with a hand mixer, add in butter, salt, baking powder, nutmeg and sugar. Cream together until completely combined and add both eggs, ONE at a time! Now add in the flour and egg nog alternately. Some flour and mix, egg nog and mix, I think you are supposed to end with flour but truth be told, I didn't, and I don't pay attention to that stuff that I am sure means something really important but never seems to make a difference to me. Get it all combined, just make sure not to over mix. Line cupcake pans with liners. This will make 24 cupcakes. Fill evenly and back for 15-18 minutes. Remove and let cool completely! Combine all ingredients and mix. If you are using a stand mixer, once the ingredients are combined, whip on high for 2-3 minutes. If you are using a hand mixer, whip until creamy and smooth. Ice cupcakes using a piping bag, or a knife and dust LIGHTLY with nutmeg. Like I mentioned, make these into minis or one big cake. I can't see how you could possibly go wrong. Light fluffy egg noggy cake and creamy egg nog heaven on top! ENJOY!! Good evening my fellow chefwannabes! Hoping this finds you all happy and doing well!! Who doesn't need dip recipes? EASY dip recipes? Fast dip recipes? Tis' the season for parties and celebrations and get togethers! 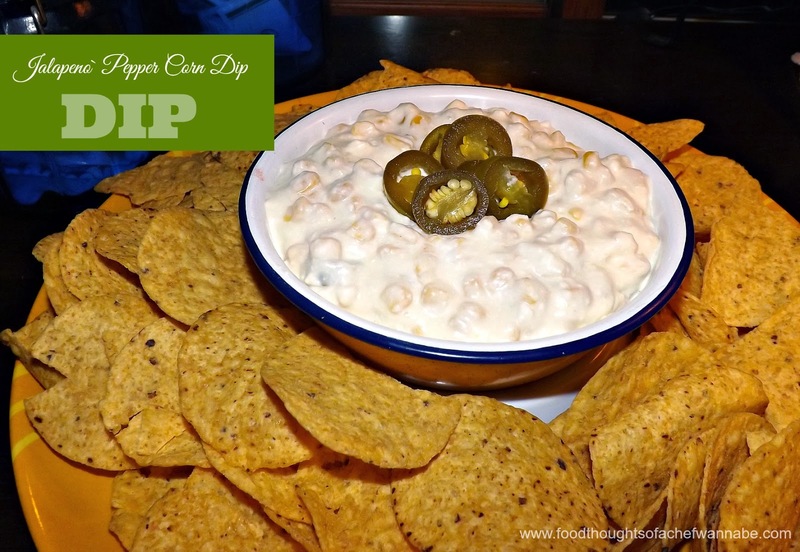 This dip is so easy, it tastes almost like a jalapeno popper! I think you could easily serve it with a small loaf of toasted bread. I know that I appreciate being able to take something to a party or have someone else bring something that is hot and can just stay in a slow cooker and keep warm. I know in my family the "pickys" are one of the best parts of the holiday season! We are pickers, and a day of all picky food instead of a meal was always a huge treat for us! It was for my son as well. His dream come true, and as a matter fact, likely my husbands as well! I have a couple of chip and dip eating fools on my hands! I hope you enjoy this as much as we do!! Remember, nobody said this was healthy, so just relax and soak up the goodness! I made this in my small crock pot! Throw all ingredients in your crock pot. (or in a medium pan) Heat until cream cheese and butter are melted, stir often until that happens. Keep on low, or warm and serve with tortilla chips or any chips of your choice!! Again, I put mine in my crock pot and that way it stays warm all day or for an entire game!! Enjoy this easy, crowd pleasing dip!